Allows posters and moderators to marks posts and threads as political using the Politics icon and thread prefix, and allows users to opt out of seeing posts and threads marked with such icons or thread prefixes. The Threaded Mode plugin must be installed. The database user must be given alter table permissions. Once installed, do not uninstall this plugin lest you lose the information about peoples' political hiding preferences. 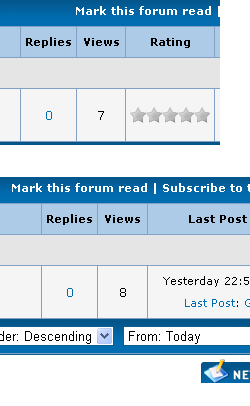 Hide certain forums from being displayed, while still being accessible by a direct link.